On my Sunday training runs for the Zion Half Marathon, I usually go for a run up Utah SR 9, heading towards Zion from the town of Virgin. 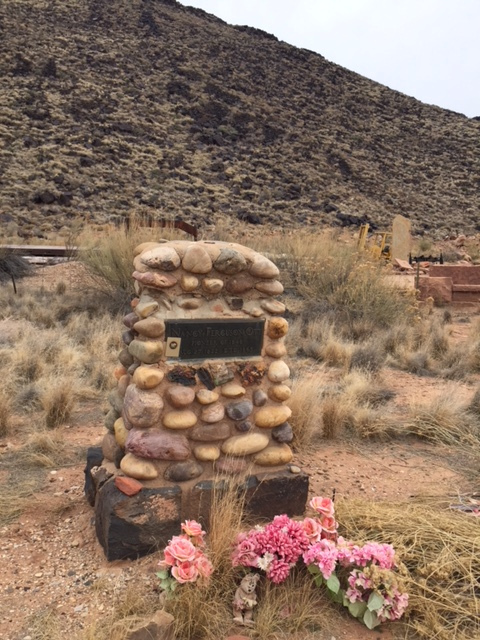 A few miles up, I pass by this gravestone just off the highway, the only remaining thing of the ghost town called Duncan’s retreat. I have never seen anybody stop here. Most people are tourists going 70 along this lonely stretch of highway, hell bent for Springdale lodging, and if they were looking anywhere it would be the other way, towards the Virgin River. A rock quarry lies just behind it, and nothing that would draw your attention to it. My understanding from other locals is that Duncan used to live in our town of Virgin (now population 600), but “retreated” to this place far from Virgin to get away from the bustling metropolis. When Nancy Ferguson Ott died, Duncan’s Retreat had 70 citizens, a post office, families, friends. It was a town, and they thought it would stick around long enough for there to be a cemetery with more than just Nancy, but Nature and circumstance had other ideas. Now she is utterly alone, on a lonely stretch of anonymous highway, with no one around, no town, no post office, no friends no family. I stopped to look at the grave marker. There are fresh flowers, stuffed animals, cards. They are replaced regularly by somebody somewhere. I do not know who. I take some comfort in this, and I hope you do too. No matter who you are, or how alone you may feel in this world, Nancy Ferguson Ott is here, on State Route 9, miles from anywhere and anyone, to deliver this message to you: No one dies alone. You will be Loved, You will be Remembered.